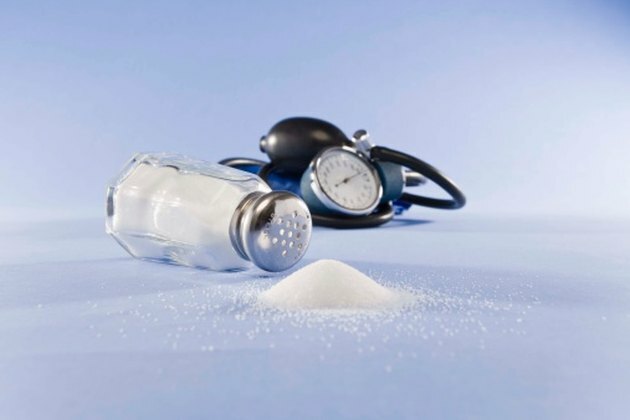 Most people are well aware that sodium, or more commonly known as salt, adds flavor to food, is a component of the water that fills the oceans of the world and can make blood pressure elevate. However, it is also true that our bodies rely on sodium to function properly. A deficiency in sodium can lead to low blood pressure, or hypotension, leading to dizziness and fainting. Sodium works in conjunction with potassium to maintain the integrity of your cells. Potassium is the component inside each cell, and sodium is located outside your cells. Both of these minerals attract water and as a result provide for a balance of liquid inside and outside your cells. The food you eat probably provides you with more than enough sodium, but to maintain the balance of your cells, you must ingest adequate amounts of potassium. Potassium can be found in potatoes, bananas, meat and milk. When the sodium levels in your blood drops too low, you may develop a condition called hypotension, or low blood pressure. This can occur through excessive vomiting, diarrhea and heavy sweating. Low blood pressure results in the blood not adequately circulating throughout your body, which can lead to dizziness and fainting. Athletes who participate in endurance activities are especially at risk for sodium deficiency. If you have been exercising vigorously for a prolonged period and you feel you might be at risk of sodium deficiency, the correct way of treating this is by drinking beverages that contain sodium, such as sports drinks, or by consuming food with salt already in it. Some athletes have resorted to ingesting salt pills. However, there is an excess of sodium in salt pills that can cause dehydration. If left unchecked, dehydration can result in weakness, exhaustion, delirium and eventual death. Your body functions at its best when everything is in balance. This is called homeostasis. Too little sodium can cause dizziness and fainting, but too much sodium has its risks as well. People who have a sodium sensitivity may develop hypertension, or high blood pressure, if their sodium intake is too high. Hypertension may result in heart disease and eventual death. The U.S. daily recommendation of sodium is 500 mg and of potassium is 2,000 mg for optimum health and fitness. Keep track of your food and beverage intake, and check food labels to make sure you get enough of both nutrients. What Are the Side Effects of Salt Tablets?